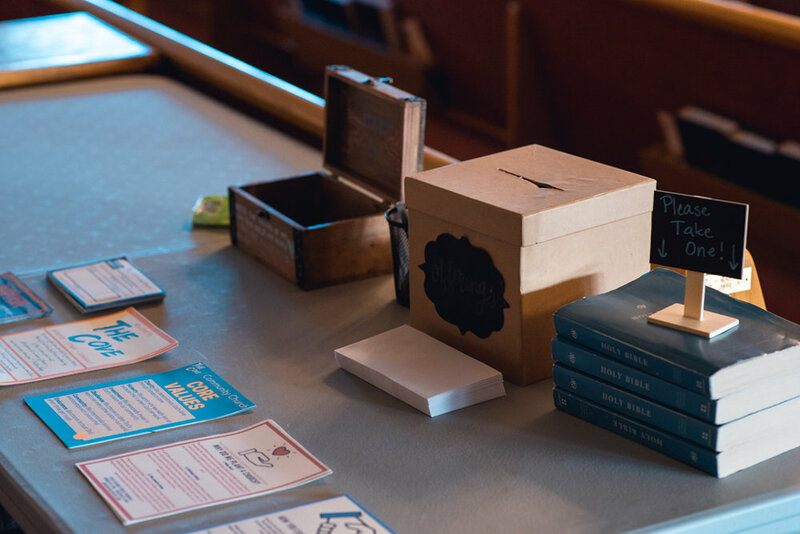 Sharing the message of Jesus means that we meet together regularly for verse by verse Bible teaching, worship, prayer, and the celebration of communion and water baptism. This is a high priority for us because we see accurate Bible teaching, sincere worship, and heart felt prayer as Jesus' method of producing health within His church. We also intentionally invite people who have never heard the gospel to our weekly gatherings. We try to pray, sing, and explain the Bible in a way that people can easily understand. Blessing our community means we assist with local needs through hands-on service at community building events and we seek opportunities to care for those hurting in our city regardless of what they believe. We want Jesus to have a good reputation in our community. The way we think this is going to happen is by our church being a part of the community and helping when needs arise that we can help with. Becoming more like Jesus together means we accept the teachings of Jesus for our lives personally and we seek to help one another imitate Jesus collectively. We offer biblical counsel, we encourage, we remind, we pray for, we serve, we sacrifice, we correct, we listen, we forgive, and we attempt to live our lives as Jesus would have us lives them with His help. We realize that becoming more like Jesus is a life long pursuit and it is only possible by the power of His Spirit in us but as a church we seek to intentionally embody the beautiful person of Jesus. One of our first worship services at our current location. Pastor Jorge and his brother John Butts serving at the Coconut Creek Farmer's Market. Dinner and fun for the whole family before service on Sunday nights. The worship team practicing before service. A small group of us praying for our night together. 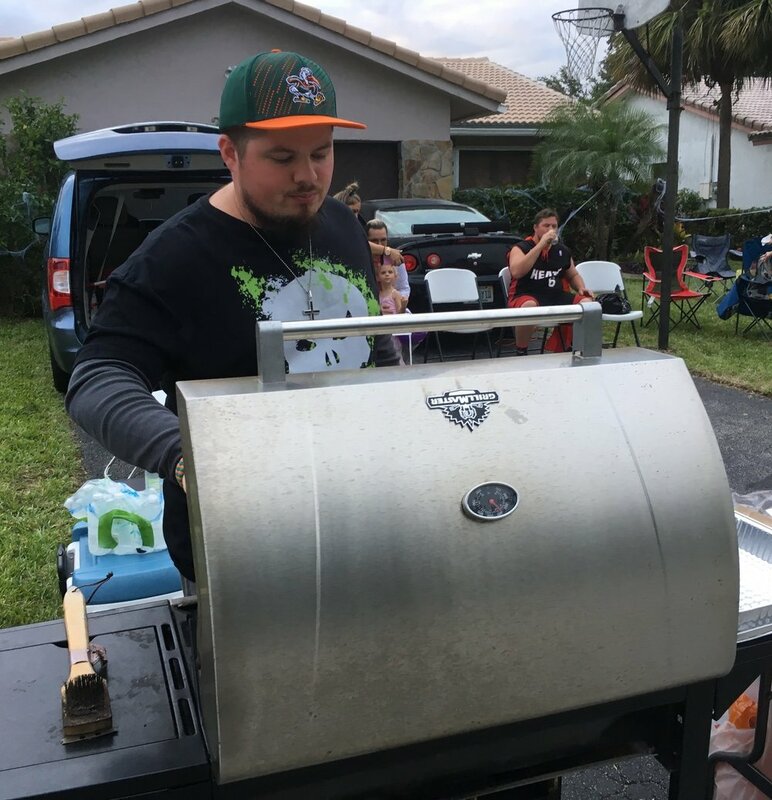 Pastor Jorge's twin brother James grilling Hot Dogs for our Halloween Outreach in 2017. Pastor Jorge and his family posing with our first sign as they welcomed people for their first church service in their home in 2017. You: We keep it simple. You are welcome no matter what denomination you belong to or if you belonged to one in the past, no matter what your level of biblical knowledge, your taste in music, your style of clothing, your native language, or any other thing you might think would keep you from feeling like you're part of our family. You are welcome to hang out with us! If you have questions about who God is, if you have doubts, if you are afraid to commit to complete obedience to God's word because it may cost you too much, if you used to go to church, if you have never been, if you grew up in a Christian home and decided church wasn't for you but want to reconnect with God, if you thought Church was a place for hypocrites and haters but you're longing for connection and support, then come to the Cove. Our hope is that you would find the peace, power, and progress you have been looking for as you hang out with us, learn about who God is, and begin to live your life obedient to the Bible's commands. Give us a Shot and see if God impacts you at our next service! Service Preview: Arrive at 9 AM and hang with us as we prepare for the morning. Grab some Coffee and pastries provided by friends. Around 9:25 you can drop your kids off with our Cove Kids volunteers. At 9:30 we begin worship with a time of prayer. We sing contemporary worship music and then get into verse by verse Bible Teaching. To close out the night we like to mix it up and pray out loud together, or sing again, or spend time in small groups, however the Lord leads us. You can expect to be done around 11:00 but feel free to hang out afterwards and help clean up or just stay for the fun as we love to hang out.